We are offering a FREE Dublin City Tourist Leap Card (each) for any booking staying 3 nights B&B for just €240.00 - based on 2 people sharing in a double or twin room. to and from CITY CENTRE and AIRPORT by bus. I may be contacted at almani@indigo.ie for further information and I look forward to meeting you if you choose this very attractive offer. 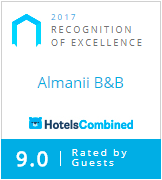 Visit www.almanii.com to book this Special Offer now !